You can’t judge a bar by its door-handle. But you can’t help but speculate on this one, at 2am in Asakusa 3-chome, amid the deserted black sidestreets after the rain. It seems a little incongruous for this patch. A little too minimalist, too elegant. What’s on the other side of this sliver of steel, this little infinity ribbon? Beside the door is a sort of teak dharma wheel with the name written above it. So, a bar. But plainly not an ordinary one. The neighbourhood is silent. Half-thriving, half-dying. Scattered fluorescent signs mark out various mama-san snack, with names like Mikan – mandarin orange. The place you are at is called Baccarat. A woman approaches, watching you. She is holding an umbrella against the few flecks of rain. High heels, click-click-click. A mature woman. Immaculately coiffed, meticulously made-up, a tight, brightly patterned dress. A mama-san, by all appearances. No really, she says. It’s fine, I know the master. You want to know what’s in there? She smiles…. I’ll tell you. A whole crowd of women being hosted by three men! She asks if you’re ok. Maybe she’s asking because in the middle of the night you are examining a door handle. You say, Fine, thanks, it’s just…this looks interesting. She says, You know you can go in and take a peek, it’s no problem. Oh no. You wouldn’t want to impose. And you haven’t got a very heavy wallet. No really, she says. It’s fine, I know the master. You want to know what’s in there? She smiles…. I’ll tell you. A whole crowd of women being hosted by three men! You should see. She indicates for you to follow, swings open the silver question mark and steps up to the inner door. Raps on it. A sophisticated looking white-haired gentleman with a tan puts his head out. He smiles at her with a warm familiar grin. 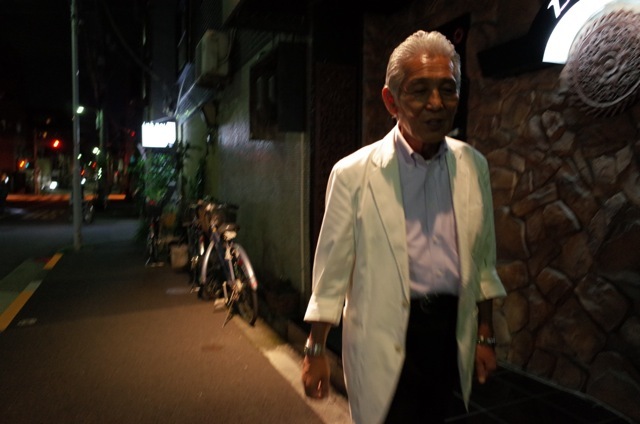 He wears a cool white-linen jacket. Green stone bracelet. She tells him you were on the street, and you want a look. He smiles and gestures you in. Standing in the doorway, you hear the noise from inside. Move closer for a glimpse. The room is smoky and raucous, the walls panelled with rods of honey-coloured timber. The counter extends away from you and you can see about a dozen women, laughing, drinking and chatting, with a couple of older men among them. The cheerful noise pauses as they turn to look at what the neighbouring mama-san has brought in. This is their party, and you decide not to stay. You nod hello, say thank you, and the master sees you out. He has barely spoken a word, but you felt a practiced hospitality. He wouldn’t have minded if you stayed. The master, Kiyohiro Kawashima is happy to talk. He says the mama-san you met was from the snack Himawari around the corner. So it was no imposition to let her push you in. You get home and reflect that after the silence of the street, it did seem a little magical. The next day you’re still curious. It’s early for Baccarat, around 10pm. There is one other customer, a woman who says she often comes here with her husband. The master, Kiyohiro Kawashima is happy to talk. He says the mama-san you met was from the snack Himawari – sunflower – around the corner. So it was no imposition to let her push you in. They sometimes drink at each other’s bars. He used to be one of the hosts at a large club across the street, Ao-heya, Blue Room. It ran for 40 years. By the time it shut down nearly 10 years ago the hosts and patronesses had grown older together. Then a construction company president opened Baccarat. 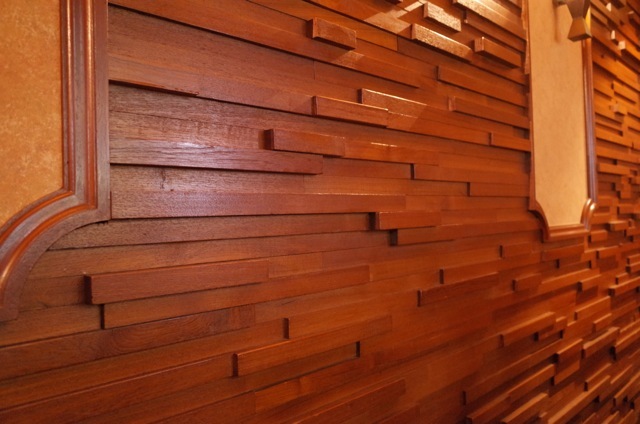 He didn’t skimp on materials, the timber, he made it look nice. Some of the veteran hosts, like Kawashima, moved over with their clients. That’s how it came to be. It’s not a host bar, although many customers may be hostesses or mamas. Couples come too, says Kawashima. Three men work the counter. It’s open every night. He reminisces a little about what it takes to be a host. You must be able to sing. Real host clubs had their own bands. The hosts would take turns at the mike. And you had to be able to dance with your client. We knew all the steps, he says. Rhumba, waltz, cha-cha-cha, mambo. I don’t know if I’d remember them now. He doesn’t say so, but you sense one other requirement is endless patience, to display the willingness to always see the best side of everyone you serve. A show of unconditional love. It would be a challenge. 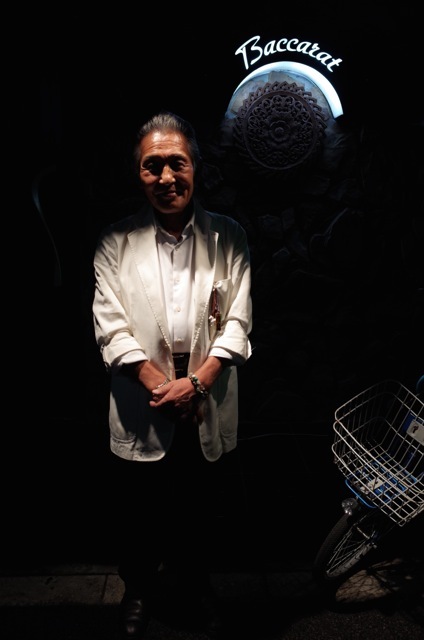 There is one host club left in Asakusa, says Kawashima, on Kokusai Dori, the continuation of a much bigger place that shut down. It had over 20 hosts. You want to check he doesn’t mind you writing about Baccarat. It seems like an introduction-only type place. It’s fine he says. You know, we’ve noticed the increase of foreigners around Asakusa. I guess if visitors are coming around here and are really curious about it, we should show off some of the real old town. 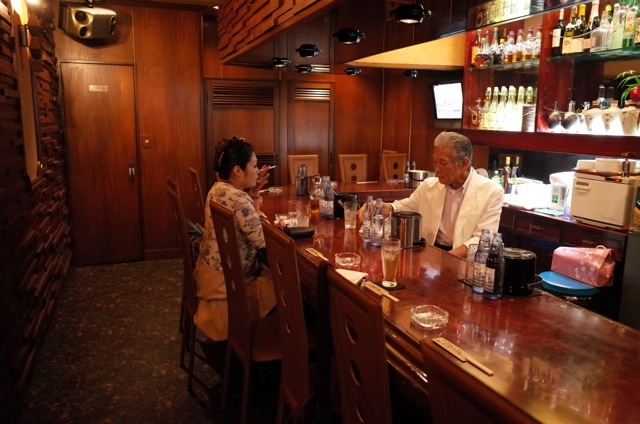 It would of course be a certain sort of visitor, one who appreciates the traditional mizu shobai water business, and that this is not a cocktail bar, and that the cost and limited menu are part of the exclusive appeal. Baccarat is at 3-35-9 Asakusa, Taito-ku tel 03-3875-1060. Open 2100–0500. 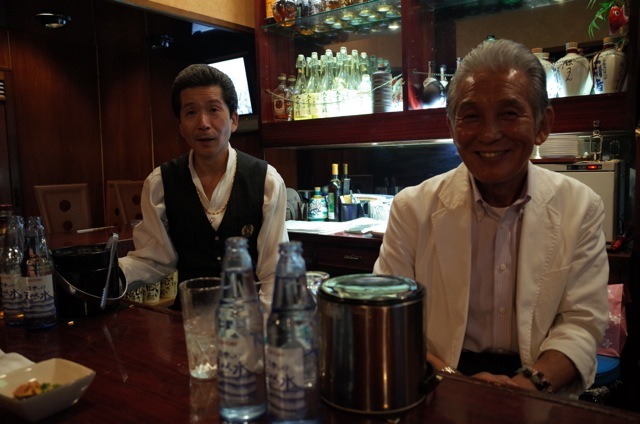 Cover charge 3,000 yen, shochu and beer from 1,000 yen.